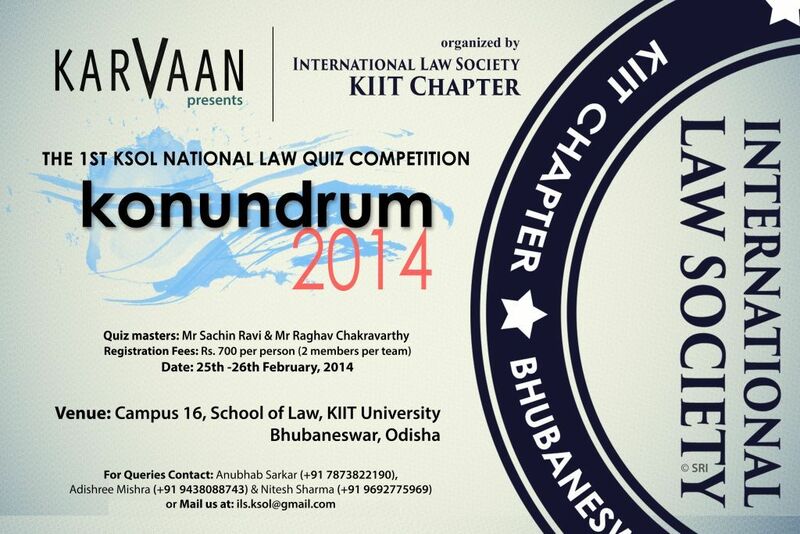 The International Law Society of KIIT School of Law, Bhubaneswar takes immense pleasure to present to you the 1st KSOL National Law Quiz Competition “KONUNDRUM” 2014 which shall take place on 25th & 26th February, 2014 at School of Law, KIIT University, Campus – 16, Bhubaneswar, Odisha during the law school fest “KARVAAN” 2014. “KONUNDRUM” 2014 seeks to be a unique quiz where participants are challenged not just to express what a certain law states per se, but to also highlight the unknown and often missed trivia behind the same. The quizmasters for “KONUNDRUM” 2014 would be Mr. Sachin Ravi and Mr. Raghav Chakravarthy. Alumni of Symbiosis Law School, Pune, Sachin and Raghav utilized their five years to imbibe as much law as they could and also managed to participate in a number of quizzes as well across the country. Through their travels, they emerged victorious in a number of quizzes on topics such as business, science and technology, IT, among other things. The quizmasters promise a unique and a fun-filled session of quizzing on topics from Indian & International Law, Geopolitics as well as Legal Literature and More! Each team shall comprise of two members. Refer to the Brochure for further registration details. Last Date for Registration: 20th February, 2014 before 11.59 pm. The quiz would contain a good mix of audio-visual and verbal questions on Indian Law, International Law, Geopolitics, Legal Literature and more.